Saturday meant a day trip with our cooler full of ice and drinks. 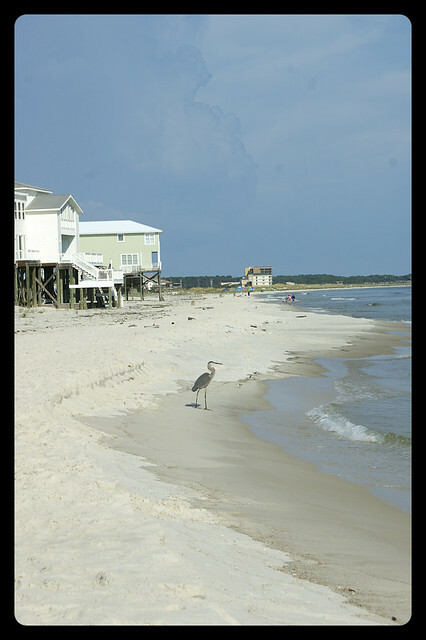 We had decided to try another beach out, to the south of us, on Dauphin Island. Not to be confused with Dolphin, which I keep saying by accident! 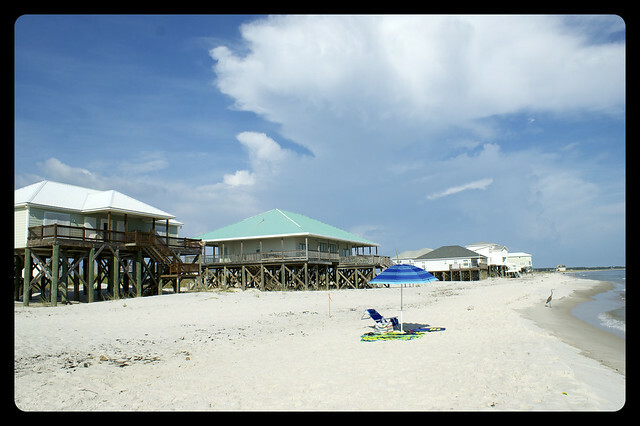 Dauphin Island is a barrier island in the Gulf of Mexico, three miles from Mobile Bay. Again, we are very lucky to have this luxury on our doorstep! The main road ran from East to West…or West to East, depending on which way you were travelling! The majority of houses were built on stilts to factor in any flooding in stormy weather. 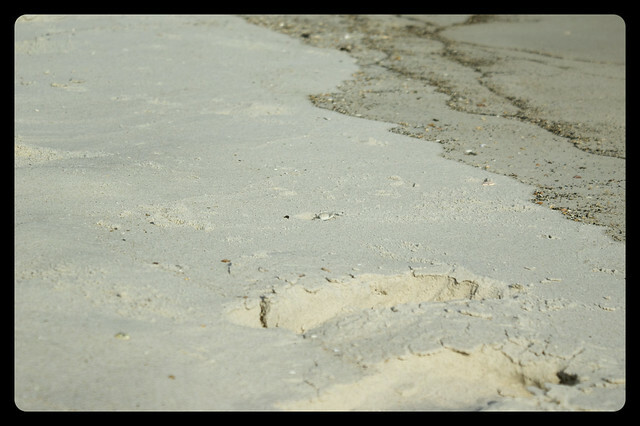 The widest part of the island was 1.75 miles wide, so everything could be damaged should the sea come in far enough. Scary thought eh! We drove past Fort Gaines and noted it down for a visit when are parents are across from the UK at Christmas. Cars were lined up waiting to board the ferry across the bay to Orange Beach. A short trip back down the road revealed small car parks that headed onto the beach. We found another place to park and this time got settled in a bug free zone. 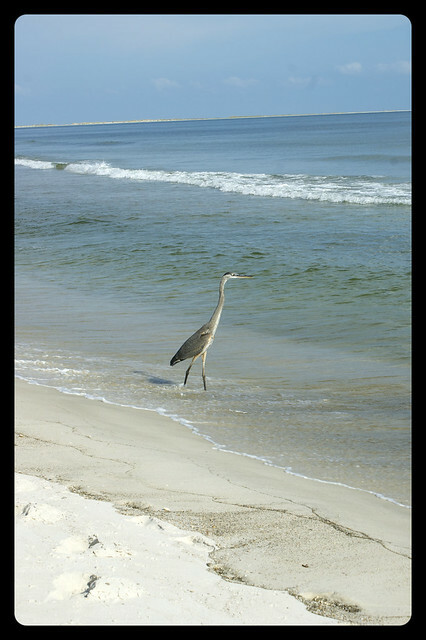 We were joined on the beach by a herony- type bird (I’m still not sure if it is a heron or not!) and many sand crabs. I’ve never been really keen on the sea as I like to see where my feet are; this cannot be done in many places in the UK! 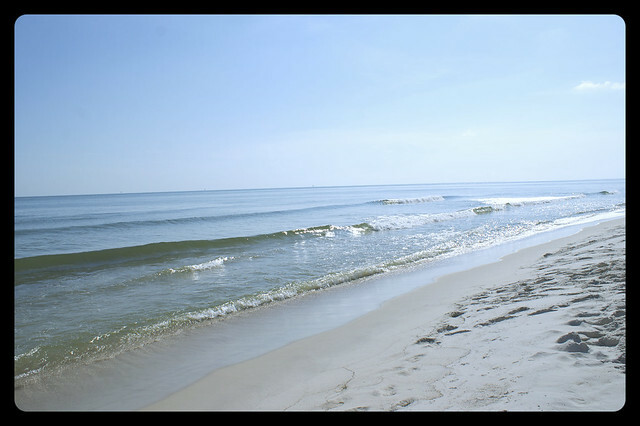 The sea at Dauphin Island had a green tint but I could see my toes. I only squealed a little bit when I felt small fish whizzing around my feet. But I could see them so I was fine. I actually headed in up to my waist…but then saw 2 stingrays swimming together about 3 foot away from me. I was out of the sea in a shot. On my way back to the beach I saw another 2 rays! I was glad to reach dry land. Wow, what fabulous photos, lucky you to have this on your doorstep. Thanks! Yes, we are very lucky 🙂 It certainly doesn’t feel like we only driven for an hour! Ooh, what a lovely trip. A nice island to explore, and that does look like a heron (to me at least). Thanks, even though it is less than an hour away, it really feels like we have gone away for the week! 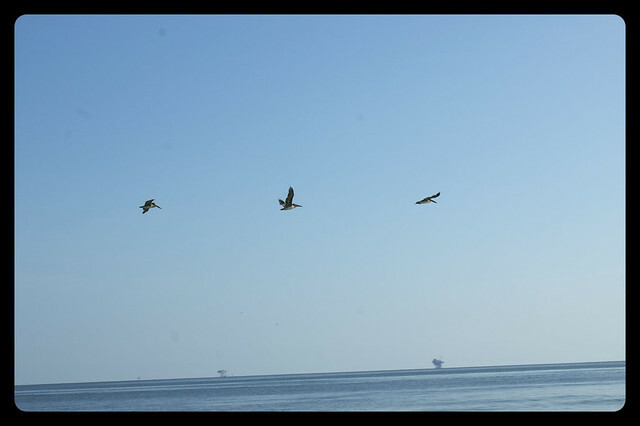 Yes,after many hours of research *friends telling me* I also think that it is a heron!